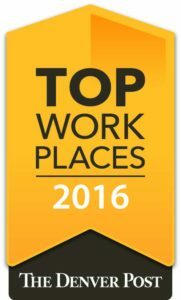 We are proud to announce, we have once again been rated one of the top workplaces in Colorado by the Denver Post Top Workplaces. This honor comes at a time when more companies, in the attempt to produce more profits and ultimately benefit their bottom line, are resorting to business practices that put workers at a disadvantage. Ward’s statements and particularly the implication of the relationship between internal happiness and the external result of customer satisfaction ring true as the list of top companies tend to display a strong foundation in both qualities. Local companies like Applewood Plumbing are setting a precedent that it’s possible to balance good employee relations with successful business practices that spark good customer service. Applewood has a more than 60 percent return customer ratio and has been recognized several times for their ethical business model. The Denver-based plumbing company has survived more than 40 years with these qualities as its priorities. Ward has grown his business with the perspective of his employees firsthand as a master plumber himself. Wards says that helped him understand the conditions it takes for plumbers, technicians and other employees to thrive and that’s what drives his approach to business. The company’s success is rooted in several programs that reflect the “family” core values of the company such as excellent benefits coverage, competitive wages, wellness and appreciation programs that include company picnics, holiday gatherings and team bonding events. Applewood also supports employee needs with updated technology, comfortable working environments and trucks fully-equipped to fulfill customer needs.